Jeesh, I think you’ve just created a demon with this post!!! I ADORE it and will definitely do this next year!! Wonderful. Reblogged this on whatever works..
All of this look so beautiful.Love it so much. LOVE them all!!!!! Amazing ideas! Wow, these are so beautiful. I must try this next year, so perfect for a small apartment. Reblogged this on Verbally Loose. This is just too good not to share! 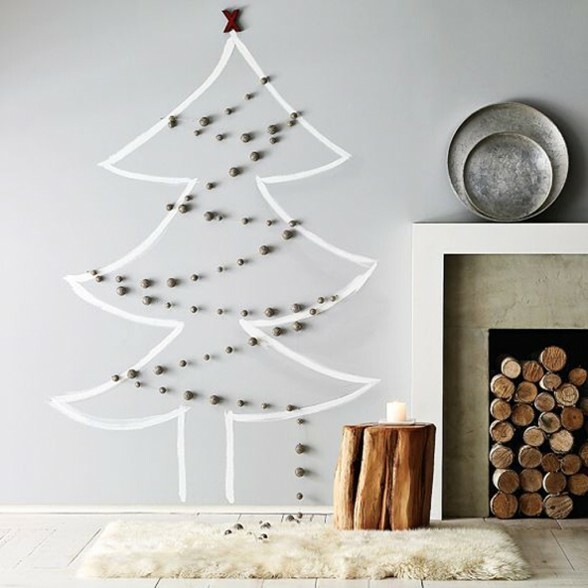 Absolutely love this idea for an X’mas tree wall. Definitely gives AMM some ideas when he shifts into his flat sometime (hopefully) next year. this is so cool!!! thanks for sharing! definitely gives me a few ideas of when I have my own place that I can do decorating! I love those ideas. I don’t think I could ever not have a tree though! Reblogged this on Super Duper Darcy ~. These are great ideas!! Thanks for sharing! What a great idea! Never thought of it. We’re going to be at a ski resort this Christmas, I might be able to implement this. Thanks! These are so creative! Fortunately, I have space for a real tree, but these would be great for tight spaces. I love the first one! The logs made it look so nice! And if you make it thicker, maybe you can store other things on normal days!